The Back Nine Slot by Rival Gaming is a golf based slot, featuring a variety of golf themed symbols including a trophy, a buggy, a young blonde female golfer and an elderly male golfer who triggers the bonus round. The game starts with a short animation of the elderly golfer scoring a hole-in-one, which sets the scene for the slot nicely. In this article I review the Back Nine slot. I start with a look at the basics of the game and the symbols which you’ll find most profitable. I then move onto an explanation of the bonus round, where you’ll actually play golf. I finish by exploring the iSlots series and then give an overview of this slot. Behind the golf balls, the players, the trophies and the clubs you’ll find a somewhat standard 5 reel slot with 15 win lines. You’ll be able to select both the number of lines and the coin amount – there is also an auto feature, so the game can run itself as you sit back and watch. The best symbol is the trophy, and landing five of these in a row will gain you 750 coins. The ‘female golfer’ wins you 500 coins for all five symbols, and ‘The Back 9’ and ‘the golf hole’ are next best. The other standard symbols in the game are ‘the putter’, ‘the golf buggy’, ‘the golf bag’, ‘the wood’ and ‘the ball next to pin’. As well as these standard symbols you’ll also find the ‘red golf pin’ which is the wild symbol. This will only appear on reels 2, 3 or 4 and if landing will expand to fill the entire reel, meaning those wins will come more often. The final symbol is a scatter symbol – this being ‘the elderly golfer’ and hitting three or more of this symbol will enable the bonus round. Having landed the symbols needed, you’ll be taken away from the slot and head to the golf course. This is a nine-hole crazy golf course and you’ll progress from hole to hole every time you hit the bonus feature. Your aim is to sink the ball in as few shots as possible. The game is fun without being overcomplicated – you’ll simply position the mouse behind the ball, the further behind the you place the cursor, the more power you’ll have on the shot. You’ll win more money the fewer shots you take, with the big money reserved for a hole in one. You’ll be able to view both your progress on the course and your score on the map which can be bought up at any time throughout the game. If the bonus round is triggered by 4 or 5 scatters as opposed to just the 3 that is needed, you’ll find that the payout is increased. 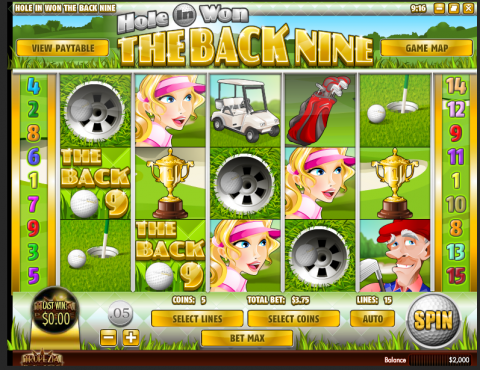 The Back Nine Slot is part of the iSlots game range designed by Rival Casino software. This series of slots aim to introduce an interactive storyline to the games, as evidenced by the short animated clip at the start of the games. These games are available on both a PC and a Mac and can be played through a browser as well as via the download version offered by online casinos. You’ll also find a selection of iSlots games available on the go, these games being designed in HTML5, making them ideal for both the iPad and Android devices. In comparison to other games in this series, this game is a little disappointing. This particular game doesn’t quite lend itself to the interactive storyline idea as much as some other games in the series, the only evolving storyline here being your progress around the course. As well as this, there is a distinct lack of features – no free spins and only one bonus feature. The bonus round itself can be interesting and is one which you’ll improve at the more you play – so perseverance can be rewarding. Having played this slot a number of times, it’s not one that really grabs the attention, however I’m sure the sporting aspect will appeal to some. I strongly recommend Slots Capital when it comes to the Rival Gaming slots range (iSlots and the standard Video Slots). They are so confident you'll enjoy the games, that they'll give you $7 free (no deposit) to try them out. See www.slotscapital.lv for details and check out the back 9 now!